I know I’m supposed to be getting on with sewing my wedding dress, but I’m easily distracted. A couple of weekends ago we went to a Welcoming party for Dan’s newest nephew. True to our slightly disorganised form we found ourselves in the week beforehand with no present and no ideas for a present. One lightbulb moment and a visit to the fabric stash later and I was on my way to making these blocks. 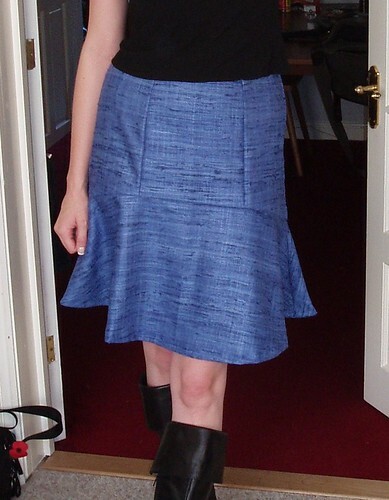 While it looks like it would be a lot of fiddly sewing, they were actually fairly easy. Each face is 7 x 7 cm. I cut four long strips of 9cm wide fabric in the gingham and the turquoise. These I sewed together at the long edges in alternating colours. As you can tell from some basic maths I did the stitching with a 1 cm seam allowance, mostly because the squares on the gingham were 1cm along the side and following the lines made the sewing easier and quicker. So far so easy, now I had a long strip of fabric that I could take a 9 cm wide slice off of for each block. The next bit was slightly longer winded. I had 18 white cotton squares that needed painting. I used Dylon iron-to-fix fabric paint, pinned the squares over black on white drawings of the letters, and traced the letters with paint. (On the back of each block is a number between 1 and 9). Constructing the individual blocks was slightly fiddly, but easy to achieve on the sewing machine. On each block I left one side open, in order to turn the block through and stuff it. This side I sealed up with handstitching. 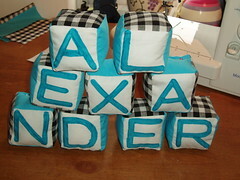 The blocks were well received, and I now have the task of filling in the rest of Alexander’s name in time for his birthday. I’m getting married this year, and the colour for the wedding is a deep blue. This poses a problem for bouquets as blue flowers are less common. While cornflowers would be available they would be coming to the end of their season and are not assured to be good quality. A florist suggested blue thistles – I love the look of thistles, but I don’t know what message I would be sending if I turned up at the altar with an armful of spikyness. After looking around online I saw, and fell in love with, blue roses. 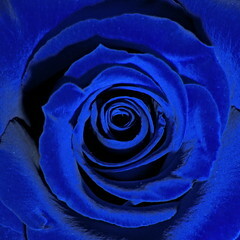 According to wikipedia blue roses convey inner feelings of love at first sight, being enchanted by something or someone. When I say blue roses I don’t mean the bred strains of lavender coloured roses that they call ‘blue’, I mean deep blue dyed roses. 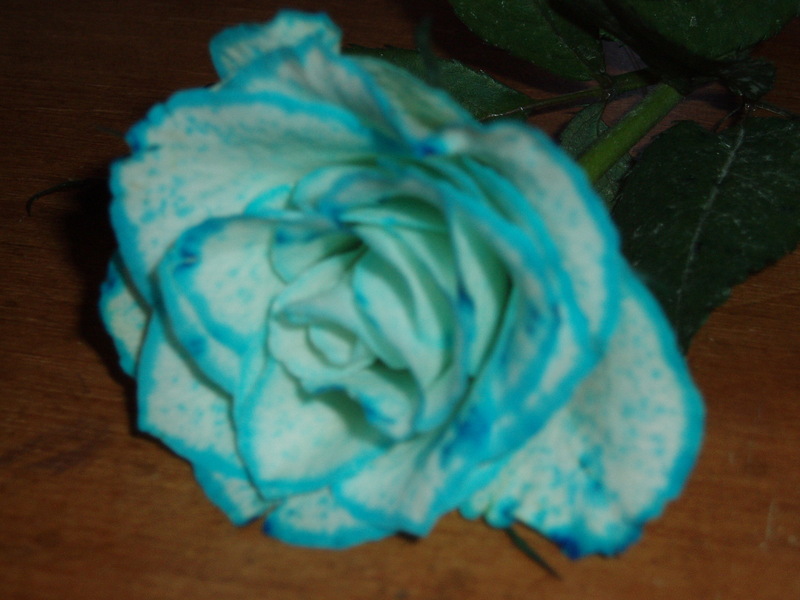 The commercial blue roses are created by cultivating the roses in a blue dye solution. I visited two local florists yesterday for a ballpark quote for flowers. One shop would not do dyed flowers, the other had very recently put together a bouquet of 12 blue roses for another customer. Both place quoted me a base figure of £65 per bouquet (without blue roses, which would increase the materials price). Judging from the size of the basic bouquets, and the size and price of other, non-wedding bouquets I can only judge that the cost of skills, time and raw materials for a small, hand-tied bouquet is about £40 max and the additional cost is ‘wedding tax’. I’m trying to do this wedding on a low budget and indulging arbitrary markup for a non-essential item isn’t on the cards. The only place that I can see that does blue roses for delivery on the internet is InterRose. Yes – their website is terrible to look at, but they do lovely roses (check out the happy roses). They’ll do 12 blue roses for £60. From 12 roses and some cheaper additional white flowers I can make the 2 bouquets and 3 buttonholes that I need at less than two thirds the price that the florist would charge for 2 bouquets without blue roses. If I’m going to pay for expensive flowers it will probably be through this mechanism. Disappointing. Only the tips have coloured and the colour is more turquoise than deep blue. I have a bag of remnant fabric in the blue that I wanted. 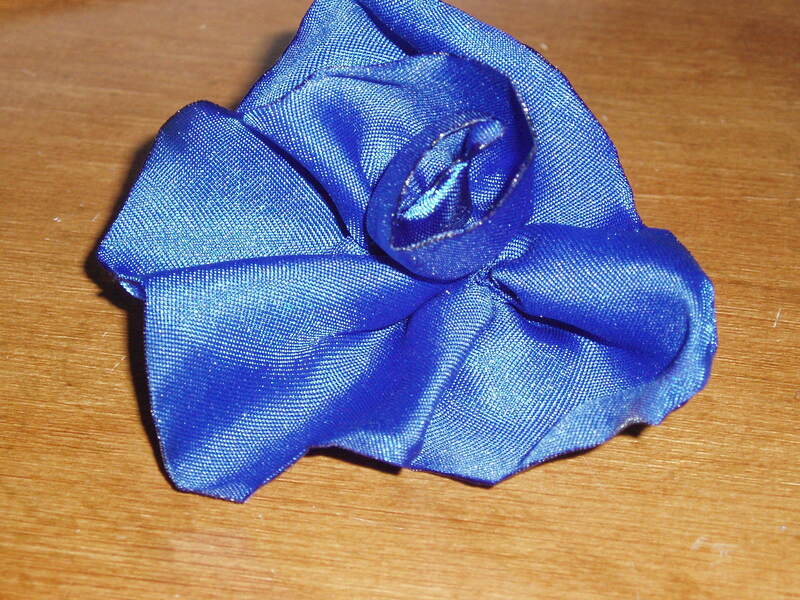 I followed the instructions at http://duhbe.com/blog/?p=807 to make a synthetic fabric rose. The only step I didn’t follow was the advice not to have drafts in the room when melting the edges of the fabric, I instead opted to open the window and work in a well ventilated area. I tried a similar method with a white cotton fabric. 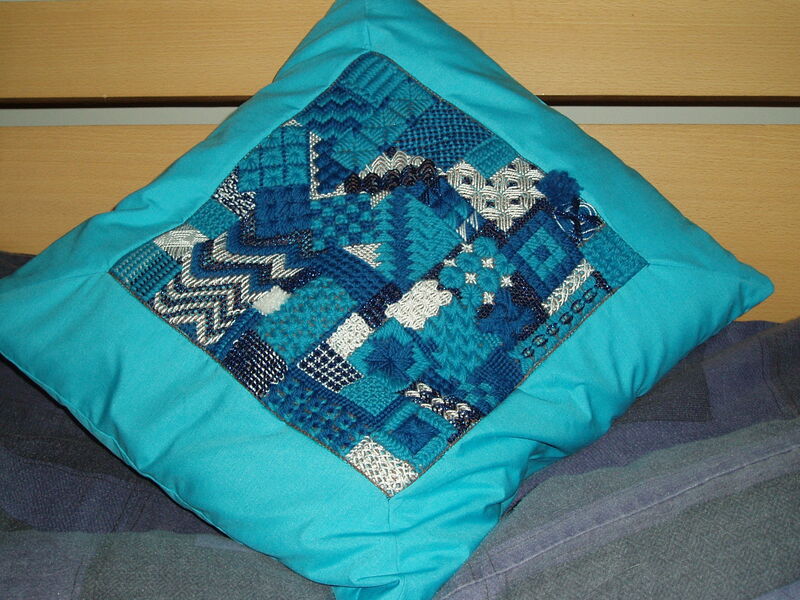 Because I used a cotton I couldn’t seal the edges with flame, but instead zigzag stitched along the edge. 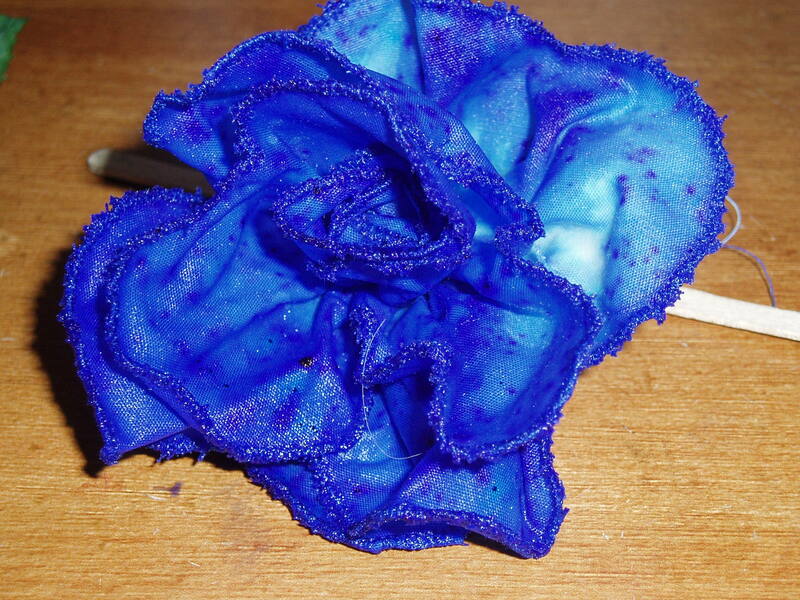 The plan was to use ultramarine Brusho to dye the edges of the petals and get a two tone effect. Unfortunately the Brusho ran a bit too much and the white was lost. I’m experimenting with other methods of colouring the tips of the petal. My search for a blue rose continues. 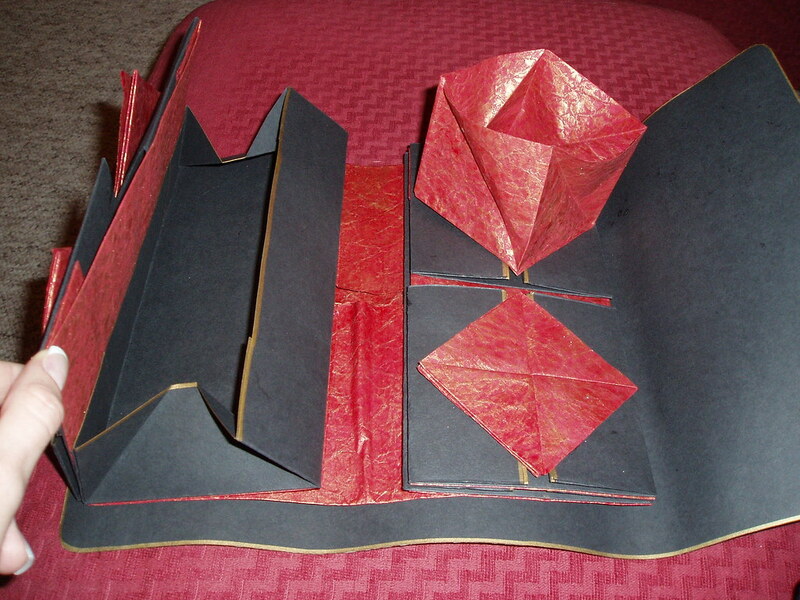 The booklets are made of folded, cut and glued paper which form boxes which fold up closed and flat. The picture above shows two of the compartments open. There are 13 compartments in total (the instructions were for 15, but I wanted my red paper on both the top and bottom so I omitted a layer in order that the colours alternate). The bottom compartment is almost square and is the full width of the booklet. Then there are two layers of long boxes on each side, one of which you can see open on the lefthand side of the picture. On top of the long compartments there are two square compartments per side (in black). On top of each of these is a red compartment that twists open. See top right of the picture for the twisty compartment in its open position and bottom right for what it looks like closed. The black boxes are made of simple thin black card. The red boxes are made from a more interesting paper. It is brown parcel paper scrunched up and repeatedly distressed until it is both very crumply and sort of fabricky in feel. I then brushed gold acrylic onto the paper with light strokes from a fairly dry brush. This way the gold paint only went on to the raised areas of the crumple. Once the gold acrylic dried I put a wash of water-based red Brusho onto the paper. Because the Brusho is water based the acrylic resists it so the gold shines through. Once the Brusho dried I varnished the paper with a watered down PVA glue mix. I decorated both sides of the paper in the same way. Traditionally the folded secrets booklets have a plain fabric cover. After having laboured so long and so lovingly over my red paper I was reluctant to cover it up. I made a cover out of the black card painted with PVA and with gold tissue scrunched on. 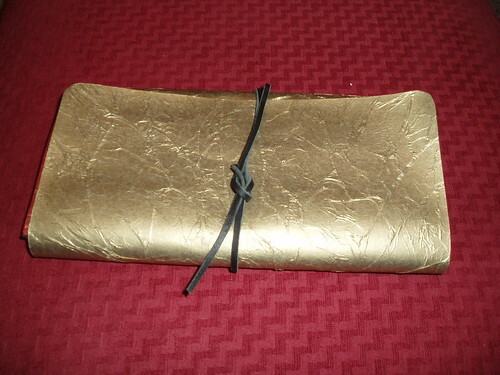 This cover I didn’t attach to the booklet, just wrapped it around and tied it with a leather thong. ***Update: Because this lady went all the way to China to find out how to make these booklets and makes money from selling the information she worked hard to gather I’m reluctant to share the exact method and measurements, even if the ‘intellectual property’ technically belongs to crafters in China. Update: Ruth Smith is the name of the lady who wrote the booklet. 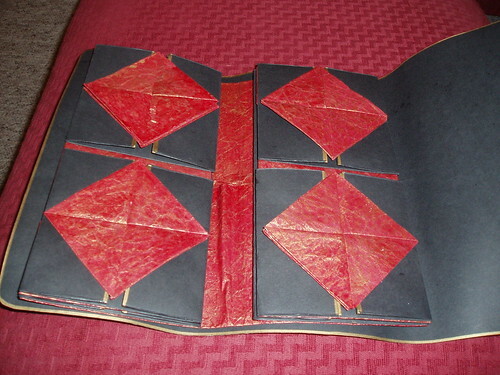 She doesn’t have a website (as far as my Googling can see) but here’s a link to a forum that has her email address as well as some photographs of traditional folded secrets thread booklets. A couple of months ago I won a Maker’s Notebook by following @make on Twitter. Now Maker’s Notebooks sure are cool things, when they first went on sale I bought one for my partner for him to design his woodturning projects in, but I’m not so much a maker as a crafter. While I like the size and the hardcover of the Maker’s Notebook and the numbered squared pages it didn’t meet all of my requirements as a crafter. 1) It wasn’t ‘pretty’. Functional, good quality, handsome even,but not pretty. Easily remedied. I decided to make it a fabric cover and paint and print on the inside covers. The fabric cover was a plain black cotton affair with faux chenille panels on the front and back. Here’s an ‘in progress’ photo. On the left it shows the 4 different fabrics that I layered to build up the faux chenille. These layers are then stitched down in diagonal stripes as shown on the right. 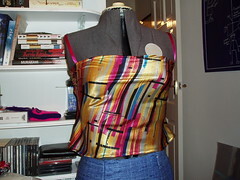 Then some, or all but the black, layers are cut through parallel to the stitching with a pair of sharp scissors. The fabrics will fray to create a fluffy 3D look. On the left is my partner’s Maker’s Notebook, on the right my Crafter’s Notebook. The faux cheniile is now very frayed allowing the different fabric colours and textures to come through. While I originally selected fabrics from my stash for their colour I found I also had a range of fabric types that all reacted quite differently to fraying. The blue lining material went thin and fluffy, the gold fabric went quite spiky, the pink silk went thick and fluffy, and the purple voile got very haphazard. The second step towards prettying it up was the inside covers. The Maker’s Notebook has a grid of little blue icons all over. Classic and simple, but not really matching my colour scheme. I was going for a purple and pink theme. Here it is, with a Maker’s Notebook for comparison again. I washed the pages with purple Brusho, then printed magenta acrylic paint onto them with bubble wrap. I carved up some lino to create a stamp of the simple spiral shape and printed it randomly in black. (The design of the spiral was the first thing I designed in my notebook). I outlined the spirals in gold marker to make them pop out in appearence. 2) All these electronics references are no use to me. Electronics is not my thing which means that everything after page 158 in the Maker’s Notebook’s handy reference pages is irrelevant to me. How to put these pages to good use? I decided to keep them as reference pages, but references for things relevant to me. When I’m designing or drawing I always spend ages colouring on scraps of paper to see what colours my pencils/pastels/paints comeout as so I thought I’d create reference sheets for those. I’ve also got a colour wheel on one of the surplus pages and the rest are gessoed ready for use. I think I’ll use them to collect image and inspirations on a specific theme per page, e.g. ‘bright’, ‘abstract’, ‘vintage’. I’m quite happy with how it turned out. I’ve already used it to design a couple of projects. Implementation of said projects is not yet underway but watch this space. These past few evenings I’ve been working like crazy on random crafty projects. This spate of productivity was brought about by the purchase of some new plastic storage containers for my art materials. After packing things into the drawers I had the cleanest workspace I’ve had in a long while. I immediately took advantage of this. 1) Belt. During my tidying I came across the belt clasp pictured front and centre. This clasp used to be my Grandma’s and has languished unused in my sewing basket for over a decade. 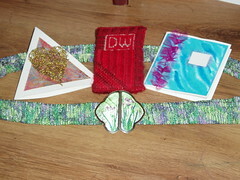 I decided to make a belt to put the clasp on using the tried and trusted bondaweb and scraps fabric construction method. 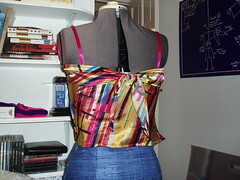 I had a bias cut black strip of cotton onto which I layered green, purple and silver scraps of fabric. 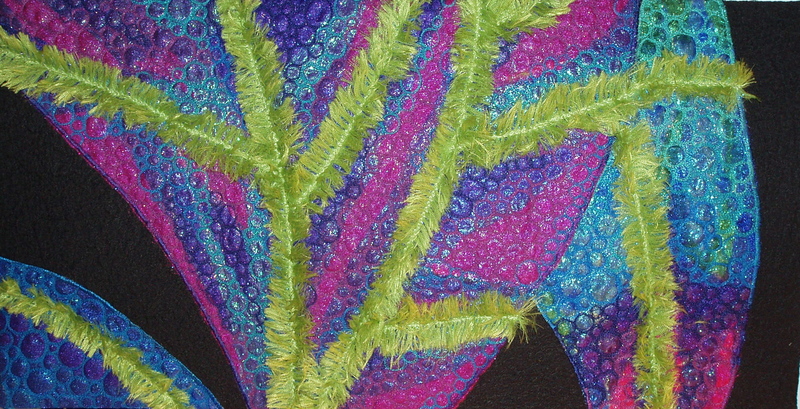 I ironed them down and oversewed with vertical green lines and meandering purple lines. I love it – it turned out fairly awesome. The only downside is that I don’t really wear green – but I don’t think that will stop me from finding excuses to wear it. 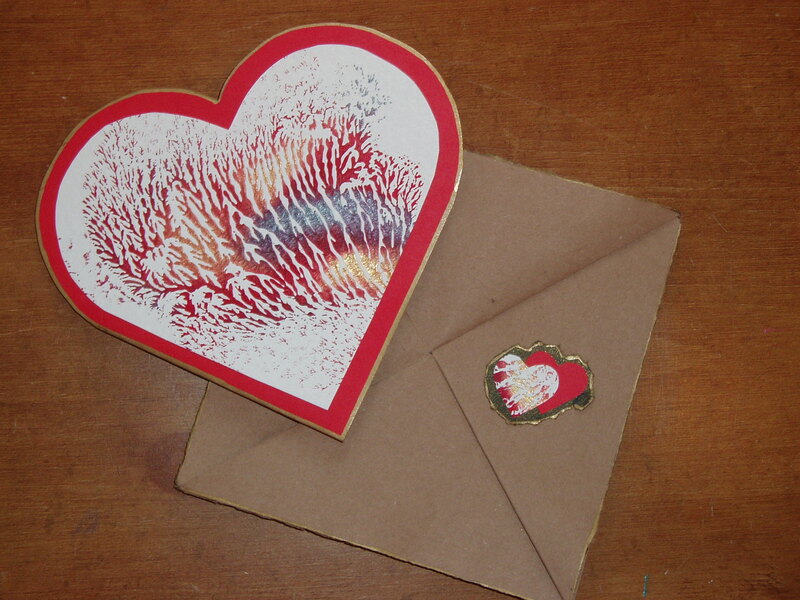 2) Handmade cards. The triangular card on the left was made for my other half on our anniversary, the other card was made just for the hell of it. They are a fun way to use up undirected creative energy and now I have a stack of cards ready for any ‘Thank you’ or ‘RSVP’ occasion. 3) Mobile phone case. I made this as an anniversary present for Dan, to match his canvaswork internet tablet case. Canvaswork isn’t the most excitingly creative of processes but I find it quite satisfying.